It started the night before when I found myself in an Ishtar in null sec. "That's why we fly Ishtars. We can't afford ammo," was Floyde's deadpan response when I was teasing (myself included) about our PvE. 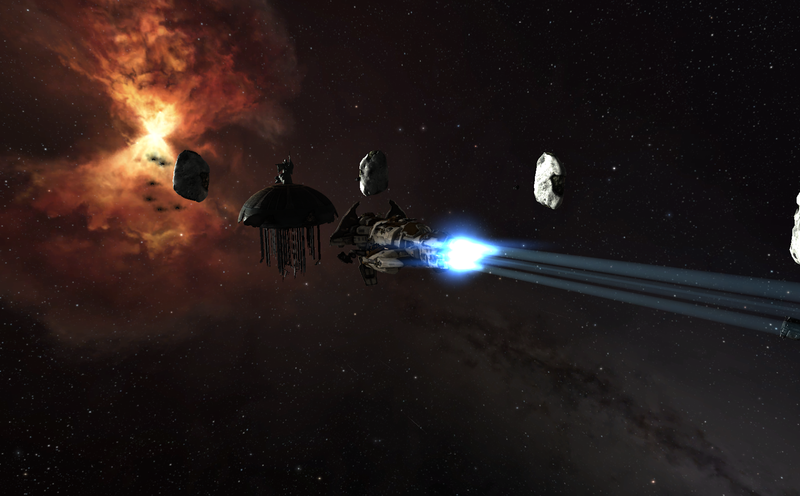 KD had asked if anyone wanted to do some Besieged sites and I had turned Vov down on a twisted wormhole journey to a 5/10 only to assist Floyde and Robinton on a 10/10 in null sec. The state of low sec has been good. All of the new exploration sites and wormholes are downright intoxicating. Where huge swaths of space would be empty and you'd jump into a system and sigh, now we're slamming face first into stuff. The corporation has started to use Siggy. These are wormhole mapping programs that we are now using to chart pathways using the increased k-space to k-space wormholes that were introduced with Kronos. This now means that four jumps can land you in a back end region halfway through Minmatar space to run a 5/10 complex instead of running the same old same old in the backyard. We are not going through wormhole space we are just using wormholes instead of gates. It's a lot of fun. When I got up today I decided to go to Istodard and pull the dust cover off of my Legion. That ugly beast that I created so long ago has sat, unused, for a year when I walked away from exploration after Odyssey. The scatter containers are gone and there are lots of interesting sites out there. I've been wanting to find faction POS mods for instance so it seems like I should go and give it a try. And how rusty I was. How unfamiliar I am with things that were once second nature. But this is Eve and we have chores. I switched out my POs reactions and dumped my silos. That done I waded into the depths of our pocket to shake the dust off. I found my first ghost site. I was a bit worried after randomly slamming my Cynabal into a besieged site and almost dying until Altaen and Kenrin came and saved me. I was nervous because I know they blow up. However, my Legion was good for it. Four cans and an unknown amount of time. I microwarped to the first one and frantically burned through the hacking game. Thirty five shattered villard wheels as a reward. I was excited. On my way to the next can rats warped in. I said on coms, "This means its going to blow up doesn't it?" "Oh." I made it all the way to the node for the last can before "Hacking Failed" and everything exploded. I was fine. A bit of shield damage. I had put on my armor repper just in case. I wound up with a bunch of shattered villard wheels. Those are selling nicely. I looked sadly at the empty grid where four more cans had once lived and warped off. I wound up selling them to Kaeda who needed them to build a blue print copy from a site he had run earlier. After that, I decided to do what I meant to do when I first built my legion. I unloaded my spoils and ran off to Great Wildlands and started exploring. Over the course of the day I worked my way through most of the system and then decided to descend even deeper into null sec and work my way through Scalding Pass, Sov Null for Northern Associates. and a few chunks of Northern Coalition. I kept finding pools of humanity. In NPC null there would be random systems with a tower around which huddled many, many ships. Sometimes there were a handful of players moving through but it was quiet. 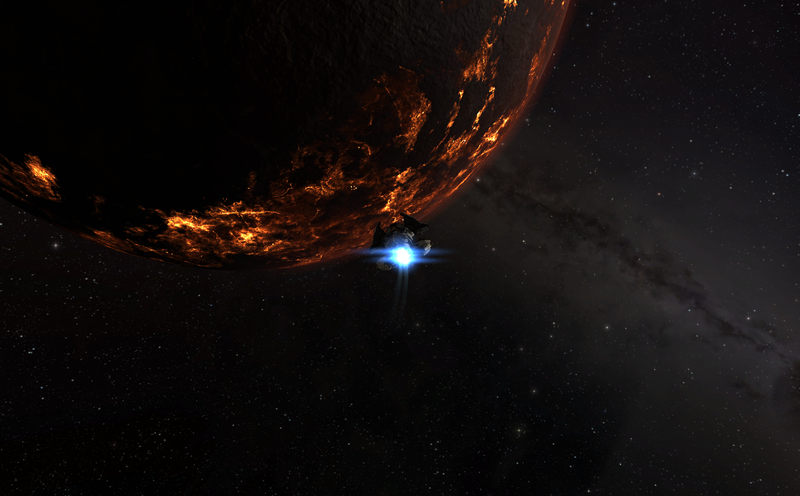 Eerily quiet if I compared it to my mining alt whose local was a steady stream of chatter. I found relic sites and one data site as well as another ghost site in my wanderings. I avoided populated systems and I came to realize that my Legion setup needed to change. This is my original legion back from when Relic and Data sites had NPCs in them. Now I need something to make the hacking game out in null sec better. I've lost a few cans and my skills are maxed. Slowly I accumulated a cargo hold of goodies slurped out of the scattered sites that I found. I did stop to undock Sugar and assist in a fight. I've developed habits to make safe spots off the beaten paths. There is no sitting cloaked at the sun at zero for me. I had very little fear. My Legion is cloaked and nullified. I slipped through the occasional bubbled gate and slunk into the depths of space, puzzled by the occasional silent faces in local. I did not worry about loss. This ship has paid for itself time and time again. It is simply fit for the task of exploration. And so I wandered deeper. Further than I ever have alone. I swept into Wicked Creek and slipped through the lands of The Unthinkables. And I was alone. Yet, I was excited. I had planned to do this so long ago and I never had. I had fears of null that held me back and now they were gone. Or, maybe it was just personal growth that I had not noticed. Yet, I did not long to dock at home. Eventually, I logged out in space. I was to far to burn back home and things were going on in Molden Heath. Priorities. And thus my day full of Eve ended with a fight in classic small gsnh warfare I do enjoy (the falcon was not ours). my mighty Throax was brilliant as it died. And I realized that I was so rusty I forgot to deploy my drones. Whoops. But I felt good. Good fights in local and a trip back home in my pod. I may need some oiling. Nothing a few more fleets won't smooth out. All in all it was a good day out in space. I'm pretty sure somewhere in my plsyformbwas the fact that I liked playing. Never heard of Siggy.. will check it out. “But this is Eve and we have chores.” This is so true! I fire up the game, see those three character pictures, shake my head in bemused derision, then click on the industrialist because . . . responsibilities. Business attended to, I look at the clock, decide there’s time for some ‘splosions. Log in the combat character and go on the hunt. I play Eve precisely because it’s not real life only to discover I’ve handed myself a virtual job with virtual vacations. What the hell’s the matter with me? Is not it amusing what pleasures we find in our adulthood? At least you're not playing 'Papers Please'. That really did feel workish. What the hell’s the matter with me? The strange lament of the EVE player. Sugar and Goblin sitting in a tree. Then comes completely retarded posts that show a completely misunderstanding of EVE social and mechanical structures. I love this blog. I've been reading it for a long time. Don't associate with someone who couldn't hack it in TEST (seriously, how do you not hack it in TEST!?) and is a laughingstock to anyone outside her Randian thoughtbubble, because it'll ruin it. I thought about moderating this. I then decided, nah. I like to speak my mind and wish for others to do so. I do admit that I find the structure in poor taste and design. I used to comment fairly commonly on Gevlon's blog. I mostly stopped when he started his ganking project and went grr goons. I've been associating with him at about the same level as now for almost two years. Occasionally I am social in his chatroom and he asks me to stop. Sometimes I remember to. I'm not a big believer in cutting people off for being different from myself. That isn't the type of person that I am. I'll also hope that I have shown personal indepdence of thought and action with a reasonable strenght of character during the time you have been kind enough to read my words. @ Anom. Who are you to tell Sugar (or anyone, for that matter) what to do? This may come as a shock to you but not all of us are brainless robots. You can read Gevlon, enjoy the spin, learn something and then totally disagree with him. Its called "thinking". You should try it some day. I had fears of null that held me back and now they were gone. Null is not very scary if you have a covert ops cloak and are nullified. And yes, it is largely abandoned compared to lowsec. On average. Ah, Siggy. In the larger w-space arena there's an ongoing debate/rumours that Siggy is not secure because it's run by someone in one of the larger w-space groups (similar to how the Aura app was/is run by someone from TEST when TEST was a power). I don't think my boys would be unhappy if they were shining beacons for people to warp to to fight. I think thats the difference. For wormholers, an breached map could possibly lead to annihilation. For empire dwellers the same map could lead to great fights. The use of WHs as a alternative routes for empire dwellers warrants observation. Taken to the extreme, it may even lead to Aridia being populated! For the amount of content Siggy. generates I'm quite happy for it to be unsecure (if it is). I'll take it :P People in EVE are way to paranoid anyway about their pixels. Gotta disagree on the paranoia issue, Kaeda (though I agree on the other - I was merely bringing inf to light about Siggy that not everyone may be aware of).